A week away from blogging and it sure felt like as though the earth had been torn and opened up, swallowed some senses and spilled out a spate of devastating haze attacks, water rationing spells and just earlier this morning, the (still) missing MAS flight code MH370 from Malaysia to Beijing. Prayers go to the passengers, flight crew and family members of the flight. Last week, Motormouth was away for a short 5 days escapade to Seoul, Korea; call that a brief respite for the ‘Seoul’ if you will. The full story to come once I collect my thoughts and emotions. 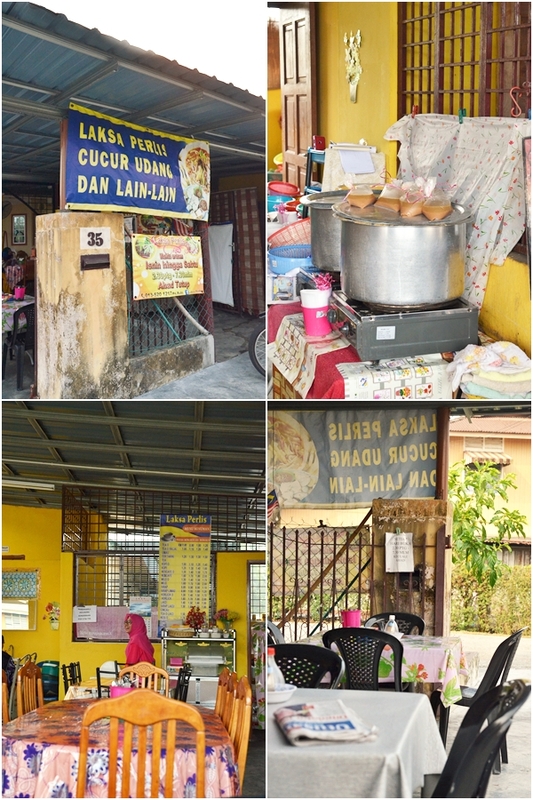 For today, let’s shift our focus to this Laksa Perlis stall closer to home; in Gugusan Manjoi in Ipoh, to be exact. Operating from the compound of their home, Puan Rubi (the lady owner from Kangar herself) sets up the tables and chairs like as though you’re dining in their house; complete with floral table clothes draping the rectangular dining tables; covered by a sheet of plastic. This post goes out to the Malay community in Ipoh and its surrounding (being relatively close to Ipoh Utara highway exit, Manjoi could be a stopover for travelers along PLUS expressway), or the Malay food lovers like yours truly. The first time I visited the premise was sometime in August last year; a few days post Hari Raya Aidilfitri. However, they were closed for about a week, and I was left stranded at their doors and merely catching sight of their business hours. To tell you the truth, Manjoi’s not entirely my playground either. Had to resort to GPS for directions, but fear not. The Google Map and coordinates to come at the end of this post. Laksa Perlis‘ difference from laksa of the other states is the use of thinner rice noodles with a softer texture; and a broth that was rich with fresh sardines from the wet market lightly spiced up with a dash of prawn paste and chili. 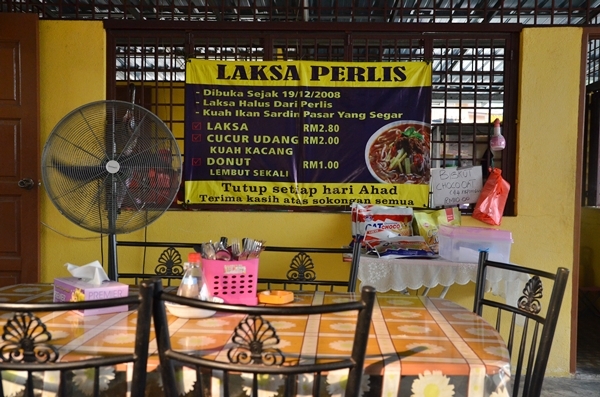 The story behind Laksa Perlis is one that’s worth remembering. The retired couple; Rubi and her husband came from Perlis and Kedah respectively to reside in Perak since 1981. Puan Rubi used to work with Telekom Malaysia; while her husband was from the government educational department. Started from the love to cook for family, friends and neighbours, they started to venture into a full fledged stall in 2008; choosing not to invest in a shop but operating from the comfort of their home. Had it not been encouraging words of mouth that lent the business its edge, you probably won’t see the existence of this stall until today even though you’re a local. Don’t get me wrong, the food was excellent and the service reeked of a hospitable, homely mannerism. But the secluded location deep in the midst of Manjoi neighbourhood will put many off; unless you’re familiar with the twists and turns of the area. 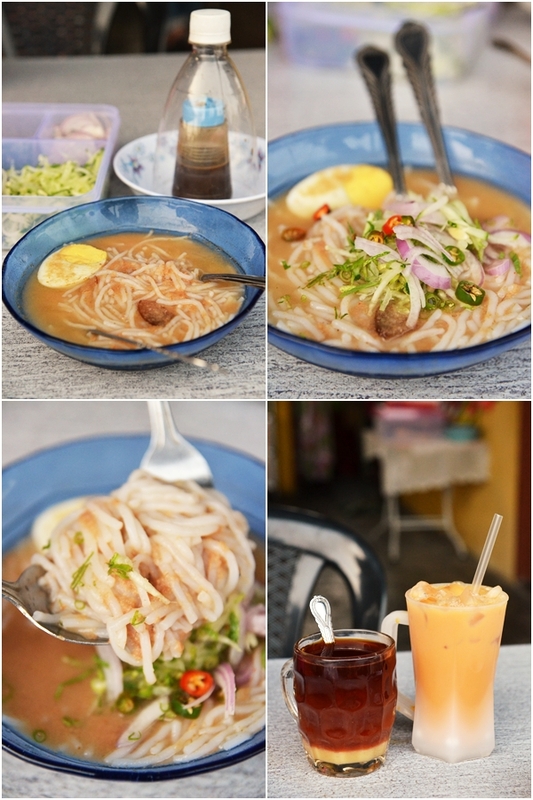 They used to search high and low for a noteworthy laksa in Ipoh. To no avail. And I do concur to some degree; for even the renowned Laksa Pak Ngah of Kuala Kangsar was barely satisfactory; and they even had mini trucks running around the state serving the northern Perak’s favourite noodle dish. Hence, the couple decided to cook by their own, bringing in batches of the laksa noodles from Perlis and concocting a delicious, wholesome broth with a faint fishy and creamy finish. 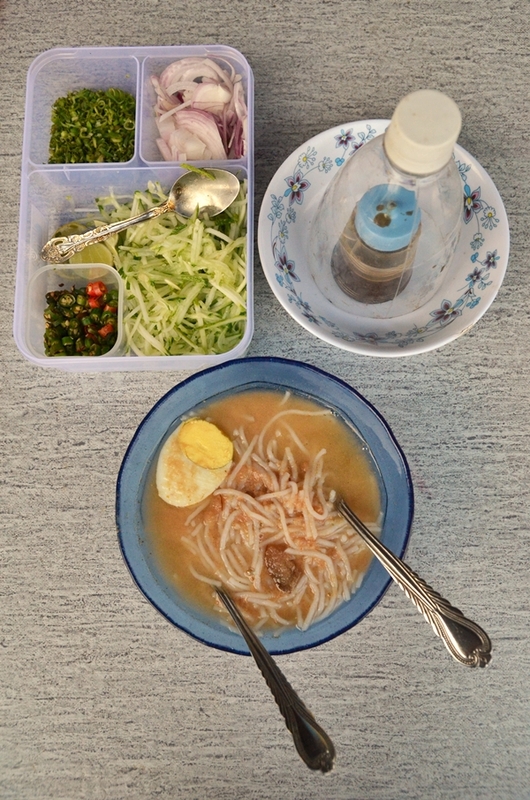 The condiments came in a separate container; chopped onions, finely-julienned cucumber, cili padi (bird’s eye chillies) and a squeeze of lime will perk up your serving of rice noodles and half a boiled egg in the broth. 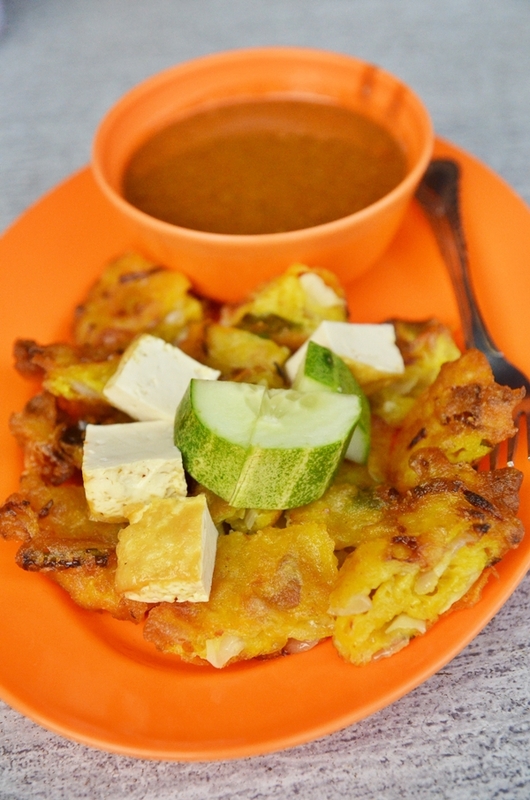 More impressively, the Cucur Udang was never relegated to being second best. However, they realize that not everyone loves laksa in Ipoh; and instead of offering random choices of noodles and making things complicated, they never took the limelight away from their famed Laksa Perlis. So they came up with their version of Cucur Udang (Prawn Fritters) loaded with sweet onions and bean sprouts, fried to perfection with a crunchy exterior and a pillowy soft batter within. The warm peanut sauce complemented the snack well; while the addition of beancurd and cucumber added substance to the side dish. This was as good as the Malay version of Cucur Udang gets. See their simple menu on the wall? The mini doughnuts (what a name – Donut Lembut Sekali) were all sold out before 5 pm; a proof of their popularity. The thing I admire most about small establishments like this one is the sheer spirit of togetherness portrayed by the family running the business; exuding an aura of warmth and comfort to every single patron walking in into their ‘home’. This is one Halal eatery comes highly recommended if you happen to be in Ipoh. 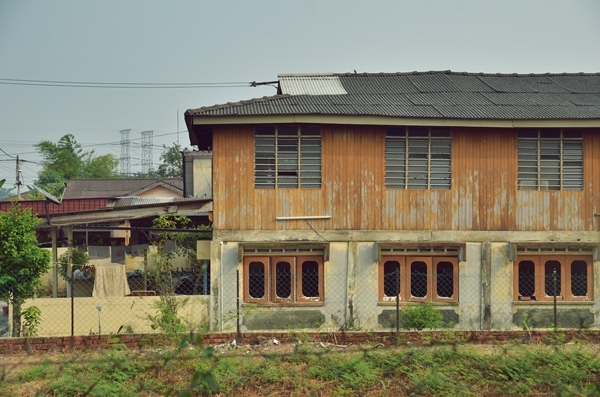 Manjoi, 30020 Ipoh, Perak, Malaysia. Business Hours : Monday – Saturday : 2.30pm – 7.30pm.